Book your Tours and Excursions online right now at the best price always guaranteed. All inclusive tours. Save time and money, no waiting in line and always at the best price directly from the tour operador (no middle-man extra charge or commission). 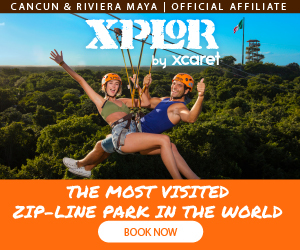 Take a look at the video below and see what you will experience in XEL-HA, one of the top tour and excursion to do in Cancun and Riviera Maya. Dare to feel the speed! We guarantee you will have fun with this swim with dolphins in Cancun with Xel-Há Primax. Touch them and interact freely with them in Xel-Há Water Park. The program is characterized by activities full of action and excitement such as the foot push. to the sacred city of the Mayan cultureThe Tour Xichen is a guided luxury tour to the archaeological site of Chichen Itzá. Visit the most representative ancestral city of the Mayan culture officially declared "World Heritage" by the UNESCO. Then, explore the colonial city of Valladolid where you can enjoy a delicious all inclusive meal. RIO SECRETO - CANCUN - RIVIERA MAYA. Dare to experience this amazing underground river with thousands of stalactites and stalagmites. GARRAFON WATER ECO PARK - ISLA MUJERES - CANCUN. Located on the island of Isla Mujeres, 25 minutes from Cancun by ferry, this natural park is known worldwide for its beauty and incredible snorkeling.